NE Montana in snit over bison restoraton, so they lock hunters out Hunting, Fishing, Trapping to Become Constitutionally Protected Rights in Idaho? Updated. All of the former clean water tributaries to the Portneuf of any important volume no longer flow into it. There is one exception — Pebble Creek. 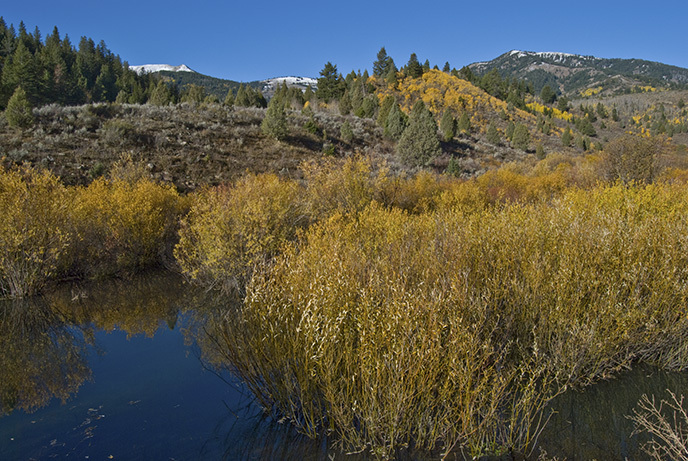 It is a beautiful creek that comes mostly from Big Springs and runs down the backside of the Portneuf Mountain Range. I caught my first fish in Idaho there. Even Pebble Creek was and is nearly cut off from the Portneuf, however. Gradually its confluence with the Portneuf was broken into 3 modified channels, or “distributaries” running through private land. Most of the stream is on the Caribou-Targhee National Forest (public land). The channels today are artificial. The largest is much like a canal. They do have some vegetation and wetland, but they do not meander much and are sluggish. There is some trampling by livestock, producing far fewer fish and wildlife than the original channels. This affects both the quality of the creek and the river. Unfortunately, this mile and a half is not going to do much for the Portneuf. But like most such things, it’s a start, and may provide an example to do more. Pebble Creek is one of our favorite places near Pocatello, although we don’t get there as often as we might because you either have to go over a mountain range on primitive forest roads, or drive up to McCammon, then to Lava Hot Springs, then follow the old highway north to get “behind” the mountains. We took our kids hiking on the back side of Mt. Bonneville for their first camping trip with us. Once you go past that first 1 and a half miles of ranch, the stream is pretty much natural, although there is occasional logging and there are always cows up there (unless you get to a spot before the cows do, like we did with the kids). The Portneuf itself has had much more damage. Some of the upper Portneuf for several miles was straightened in the same way and then eroded down into a canyon because all the meanders were taken out. The former riparian areas are all farmland and probably few people know where it was before. And a bunch of people don’t want it put back. Then below lava almost the whole thing goes into irrigation canals, which water land up into the Marsh Creek valley. Pocatello has bought up a few water rights when they come available to increase the water into the river in the summer to help recharge the local aquifer. But recently studies have shown that most of the aquifer comes from streams southwest of Pocatello, so I don’t know if they are going to do that again. There are stories from people who grew up in the 40’s or 50’s who talk about the great fishing in the river even at Pocatello. I doubt anything like that will be restored in my lifetime or maybe another lifetime. But there is some progress round about. And the Portneuf has pretty good fishing some places above Lava, I understand. I think it’s a little too cut down to look like a normal river. Tall grass and then a sharp drop of two or three feet. I don’t see gravel bars.